We’d love your help. Let us know what’s wrong with this preview of Leo's Salvation by A.M. Halford. Leo Eaus, a warlock from a cursed coven, hopes to make up for the sins caused by his family in the past by working as an exorcist. Agnar Landvik, a berserker bear shifter, only hopes to get through his lonely days without killing his friends in the Twin Ravens MC. Their paths cross when Leo's job takes him to Tulsa Oklahoma. Agnar sees Leo as the end to his lonely days. Leo only sees what could happen to Agnar if Leo's secret was ever discovered. While they struggle to come to an understanding and form the relationship destined to be theirs, troulbe stirs in the shadows of Tulsa. It'll take Agnar and Leo working together to subdue this new threat. 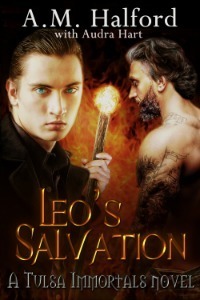 To ask other readers questions about Leo's Salvation, please sign up. A Supernatural Series with Wonder and Fun! We start out with Leo in Oregon. He has been running, from those who feel he is a threat, all of his life. He is haunted by a lineage that others believe make him a threat. Leo is trying to do everything he can to disassociate himself from his familial line. His mixed heritage is something he tries to hide from any other supernatural being. Leo takes a job in Tulsa that winds up sending him right where he doesn't want to be. A place where everything he ha A Supernatural Series with Wonder and Fun! Leo takes a job in Tulsa that winds up sending him right where he doesn't want to be. A place where everything he has tried to run from Will be exposed. A place that puts not just his life in danger but also the life of the one person who could redeem him! This novella is set in Tulsa, Oklahoma, is fast paced and the world building is great! The characters interlink with another series and gives us fun crossover. It has appealing leads, offers good suspense with a nice twist in the plot and includes some hot M/M action that leaves you with a warm fuzzy feeling. Not a bad read, enjoyable! Not a bad read, enjoyable with a good storyline. Angar is bored with his life as a bobyguard and member of the MC. Leo is trying to hide in plain sight, so to speak, as a exorcist. He reluctantly takes a job for a human in Tulsa only to find the problem is at the MC club. Things get lively from there. The synopsis does not do this book justice in my opinion. It was so much better. Do yourself a favor and read it. It's always fun to read about people finding their mates...especially if they figure they'll never have one due to the type of being they are. Leo has been on his own since he was 12 when he watched a tragedy happen right in front of his eyes. He made it his life's work to rid the world of the cause of his lonely life. Agnar has been alone for far longer and is ecstatic when he meets his mate. Things of course never go smoothly and Leo and Agnar are in for a fight. Leo's Salvation is another awesom It's always fun to read about people finding their mates...especially if they figure they'll never have one due to the type of being they are. DNF @ 30%. Agnar didn't protect Leo. His mating instinct was weak. He followed Tank's orders to capture and imprison Leo even though Tank would turn Leo over to the PNR council who would then execute him. Leo had no survival instinct. His mating instinct was so strong it made him TSTL. Even though he escaped, Leo then returned to Agnar knowing that he would eventually be killed. The Twin Ravens MC were unlikable. Tank and his crew acted juvenile. A berserker and a warlock, now if they can get past the vampires and stay off the council's radar they might have a chance. Not her best work, mainly because it was hard to understand the other characters since I didn't know anything about the universe, but overall a good read. I live in Southern Oregon and enjoy spending as much time outside as I possibly can. My partner and I often find ourselves hiking with our two dogs when the weather permits it. Fishing, camping, and photography are also activities I greatly enjoy. If the weather doesn’t permit going outside I like to curl up with a sketch book and draw whatever comes to mind. I got into writing as an outlet for per I live in Southern Oregon and enjoy spending as much time outside as I possibly can. My partner and I often find ourselves hiking with our two dogs when the weather permits it. Fishing, camping, and photography are also activities I greatly enjoy. If the weather doesn’t permit going outside I like to curl up with a sketch book and draw whatever comes to mind.